Dimensions: 9 7/8" x 5"
Born to an aristocratic French family, Hilaire-Germain Edgar Degas is best known for his portrayal of the more humble aspects of 19th century Parisian life. His graceful ballet dancers, capturing the intimacies of backstage moments, have secured his place as a master of Modern Art. Unlike his fellow Impressionists, Degas cared little about using natural light, and passionately sought to expose the beauty of spontaneous movement. 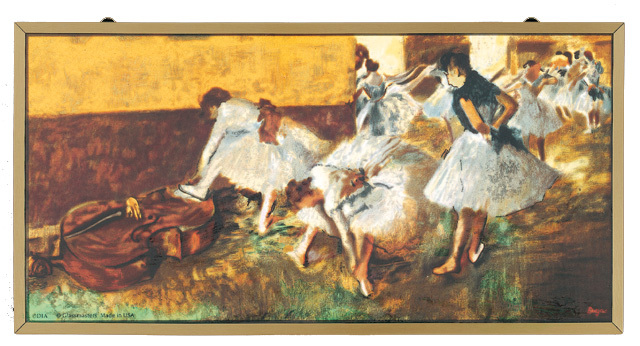 Dancers in the Green Room was painted in 1879, as Degas eyesight began to weaken. The utilization of green, red and yellow, together with the pre-show tension of the scene, make this a quintessential Degas tableau.